If true, it could add to the losses the sector is surviving with since September 2014 floods. 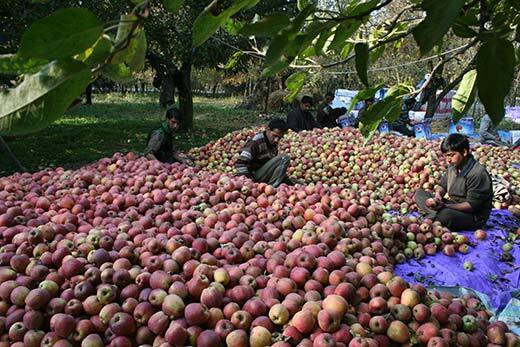 Post-floods, Kashmir apple production nosedived to 11.70 lakh metric tonnes (mt). For more than two million growers managing 2.18 lakh hectors of orchards, 65% of them apple alone, this much of production is too small. In 2015-16, however, fruit production improved to almost 24.93 lakh mts. Kashmir apple alone was 19.21 lakh mts. Akhtar Hussain, Deputy Director Horticulture, says the production and losses for the current fiscal (2016-17) are not calculated yet. He believes, however, the losses could be less. A scene of apple harvest. “Hot and dry summer had its impact and then political unrest prevented us from last two crucial sprays,” Abdul Shakoor, a south Kashmir grower, said. Amid protests and crackdowns, the harvest was quick. The sector confronted a series of serious issues that impacted the margins. Firstly, the disturbed situation since July triggered a scarcity of packaging material. Off late, Kashmir consumes lot of cardboard, bulk of which comes from Jammu. This year, local production was restrictive forcing growers to use wooden boxes which are costlier. Secondly, local terminal markets, the mandis were closed. Mandis in Kulgam, Pulwama and Shopian did not open this year. The in Sopore and Srinagar worked around midnights for a few hours. Thirdly, no non-local buyer came to Kashmir that prevented competition. As local players jumped in, apple again became a buyer’s produce. Fourthly, grower was desperate to see the crop getting out of the orchard and reaching the market somehow, regardless of the returns. In absence of adequate transport, freight touched skies that reduced the margins. Truckers doubled and even tripled the freight. At high freight, they pushed the crop to Delhi, Jammu, Mumbai, and the sudden despatches triggered glut that reduced the rates. Basheer said the markets have stabilized and rates gave improved. “But almost 75% of the produce is already consumed,” he said. 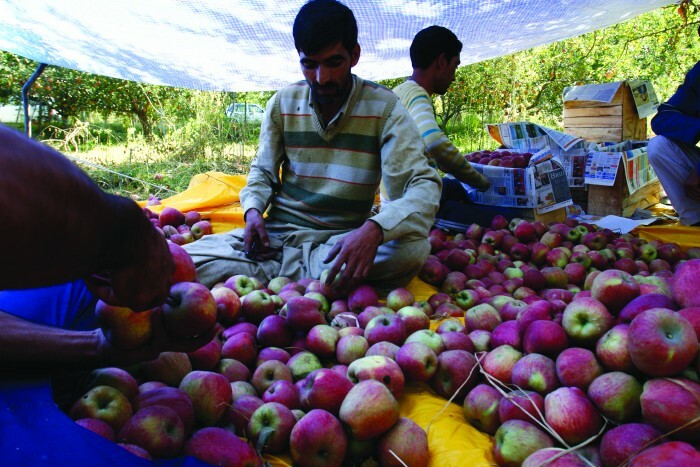 Early stabilization was partly because Himachal Pardesh produced apple in much less in quantity and quality which helped Kashmir apple to bounce back fast. The growers and dealers insist that restrictions imposed by authorities compelled them to sell the fruits in an unplanned and unorganised manner. At one point of time, the Jawahar Tunnel was closed for around 10 hours. Part of the desperation for selling the crop came from a series of raids in which the government forces damaged the harvested crop. 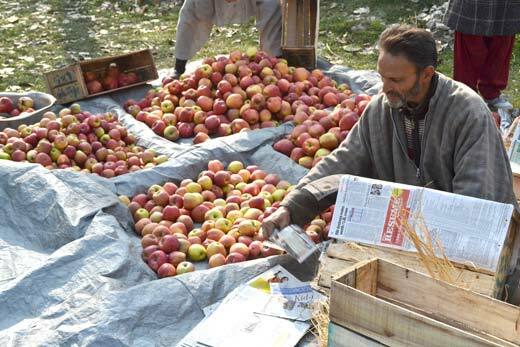 Ghulam Qadir Pandit of Pulwama lost 500 ready-to-load apple boxes to one such raid. In a few cases, Basheer alleges, crop was damaged while it was on trees. Apart from serving most of the mandis across Indian mainland, Mushtaq Ahmad said part of the crop would go to the border markets near Nepal and Bangladesh. “This year, accessing Delhi was difficult and reaching the outpost for Bangladesh and Nepal was literally impossible,” Ahmed added.